Dropper seat posts. We love to hate them and hate to love them! If you ever put one of these things on your bike, be prepared, because I can almost guaranty that you will be come addicted to it. You will wonder how it was that you ever rode without one, and will tell all your friends that don’t have one that they need to get one. I can also almost guaranty that it will eventually fail. I work in a bike shop and have to deal with these things everyday, and have watched, I estimate, 90% of them break. Yet people love them. I myself have owned 4 of them, only one hasn’t needed replacement (yet!) It was the first product I ever bought (Crank Bros. Joplin), in full confidence that it would break! I did it anyways because I hated seeing my friends blast away from me while I stopped to adjust my saddle height. And to be honest, for as long as it was working, it did the most to improve the flow of my ride more than any product since the invention of the suspension fork. Which brings me to a worthwhile observation. 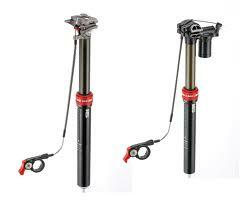 The suspension fork was one of those things that did the most to revolutionize the sport of Mountain Biking. Despite the fact that the early ones felt like crap, needed tons of maintenance, and they broke often. Sound familiar . Yes, and once you had your first taste of squishy up front, you never did go back, did you? No, and that is because the riding benefits were for real. It took a few years, but eventually suspension forks got to the point they are today, where durability isn’t a really big issue, and maintenance is fairly painless. Few people will ride without them. Of course they will never be as problem free as a rigid fork, and I don’t expect that dropper seatposts will ever be as reliable as a good old fashioned straight seatpost. But just like suspension forks did in the 90’s, dropper posts are going through some birthing pains. On the other side of the tunnel, which is in the very near future, the dropper post should hit its stride. Crank Bros. got the game rolling by taking over the Maverick Speedball project, and producing the Joplin. These posts became wildly popular 5 years ago, and even though they broke always, and often, they did manage to create a need for a seatpost that was adjustable on the fly. 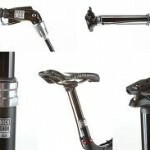 Now other companies have come into the game with offerings that are increasing the performance of dropper seat posts. be a few weight weenie hold outs in the cross country field, but in time even they will recognize that the added weight is worth it. And with companies, like Blacx beginning production of a downhill bike specific post, the game is really changing. Yep, the time is right, and the future is bright for dropper seatposts. If you don’t have one on your bike soon, be prepared to get left behind. 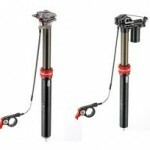 I love the Rockshox Reverb! Smooth action, and very little play. The Fox DOSS should be exciting to see, when it finally is released. What about the new CB Kronolog ??? It will kick!! It looks cool, like all Crank Bros. stuff does, but I can’t help but be a little hesitant given their previous records! Will have to wait and see how it goes, eventually they will have to get it right. You forgot to add nagetive: weight I’m all for mechanical post (seeing so many hydrolic fail or require non trivial maintenance) that I started with Gravity Dropper (super easy service, spring too strong/loud and can’t adjust unlike CB). Even though CB uses air spring, it is a LOT heavier than dropper and Joplin 4 (I have all 3). I like fixed position better (want to know I fully raised due to bad knees) but wish CB wasn’t so hefty compare to my other 2. I haven’t measured the Gravity Dropper, so I can’t comment on its weight, the new Blacklite version of the CP, is lighter, and most of the adjustable seatposts are within the same weight range, none of them are in the least bit light compared to a normal post, so saving 50-60 grams compared to 200-300 grams isn’t even close? Far less technical in action, a simple spring which clamped to the seat post and a loop which sat between the tabs on the seat post clamp on the frame (see here : //www.bikepro.com/arch_products/seatposts/ahiter.html). This came in a regular (3 inch travel), and long version (4.5 inch travel). To put the seat down, open the QR lever on the seat post, sit down. To return open the seat post clamp again, and standup; alternatively just leave the clamp open and the seat will/would float with you. P.S. – Oh – and they didn’t break! But isn’t it nice to keep both hands on the bars sometimes? I have owned the Reverb for over 12 months now & bilveee it to be one of the best additions any serious rider could wish for. 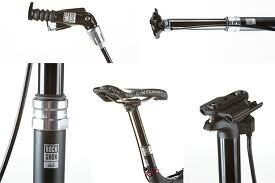 However, I don’t know why Rockshox recommend installing the Reverb activator on the top of the handlebar. After seeing pictures of a few broken push levers due to unplanned dismounts I purchased the right hand model & mounted it on the left between the shifter & bar grip. It is now protected by the handlebar. No stretching the thumb & no danger of destruction when your skill runs out. My Reverb lasted 1 ride and blew its seals, sent it back for a week for riaper, 6 weeks later, it blew again.I now have a Gravity Dropper turbo, not perfect, but I can service it myself. 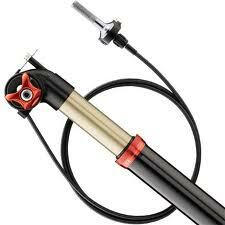 This to me is the single most important factor when buying a seatpost. I also like its set positions rather than the anywhere you like Reverb.